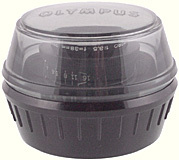 This is one of the original set of 3 bellows macro lenses for the Olympus OM system and was first produced in 1972. 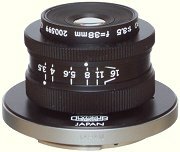 Unlike nearly all of the other OM lenses, this one has a preset manual diaphragm instead of an automatic one, and so exposure has to be measured withe lens stopped down. Focusing is easier with the aperture wide open. Like the other 2 manual macro lenses, the aperture scale appears upside down when viewed from behind the camera. This is because this lens was expected to be used pointing downwards on a copy stand or a macro stand, so that the scale appears right way up when viewed from the front. This macro lens is designed for magnifications from 1.8× to 6× and so it is appropriate for objects ranging from 20×13 mm down to 6×4 mm. The Zuiko Macro 38mm f/3.5 lens is intended for use with the Auto Bellows, although it can also be used with the Telescopic Auto Tube 65–116 that was introduced in 1980. It can also be used with extension tubes, but with fixed magnifications. The Zuiko Macro 38mm has a small screw thread mount (RMS – Royal Microscopical Society – thread, 0.8″ diameter, 36 t.p.i. ), the same as many microscope objectives, and requires an Objective Lens Mount PM-MTob to convert it to the OM bayonet fitting. This lens pre-dates the macro flash and ring flash units, and so does not have a filter mount for attaching them. However, it is possible to use strong glue to fix an empty 49mm filter mount to the front of the PM-MTob adapter. In 197?, this lens was discontinued and replaced by the Zuiko Auto-Macro 38mm f/2.8 lens, which is faster, has an automatic diaphragm, has a standard OM bayonet instead of the RMS screw thread, has helicoid fine focusing, and has a 49mm filter mount for attaching the macro flash units. This was one of the very first OM lenses, and some boxes were made with the original “M SYSTEM” designation that was replaced in January 1973 by the familiar “OM SYSTEM” designation. It is not known if any “M SYSTEM” lenses were made. This lens has no interaction with the camera body. The manual pre-set mechanism for closing the iris diaphragm works exactly the same on film and digital cameras. This lens was designed exclusively for macrophotography in conjunction with the Auto Bellows (an optional coupling attachment * is necessary). The lens is multicoated to minimize flare and ghost images. The assignment for this lens is to exert high resolution and contrast at magnifications from 1.8× (13mm × 20mm) to 6× (4mm × 6mm). In macrophotography at such high magnifications, illumination, camera stability and subject’s position become hard to fine adjust. The use of a macrophoto stand and accessorial illumination devices is recommended. The PMT-35, a highly sophisticated macrophoto apparatus, is available for advanced amateurs and skilled experts. Compatible focusing screens are 1-11 and 1-12. The 1-12 (cross hairs-clear field type) offers a brighter image, but the meter built into the OM-1 and OM-2 (on MANUAL) does not give correct light readings. With the OM-2 on AUTO, correct exposures are made on the film but the meter needle does not give correct light readings.